My name is Tracey Langford. 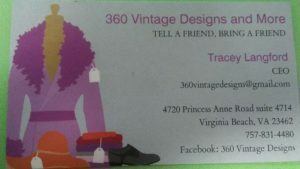 I am the owner of 360 Vintage Designs, located in the Kempsville area of Virginia Beach. 360 Vintage Designs Boutique is a Diamond in the rough, and full of excitement. In fashion there is so much to choose from. There are so many things that differ from the others. I can’t help but think, people are always wondering what shoes, clothing, and accessories they should purchase without spending a lot on their fashion trends. To have great style should not cost a lot. As the local teens shop around for their unique attire for many special occasions, they want to pay as little as possible. There are savings at 360 Vintage Designs, so why go out of the city to save on fashion trends? Shopping can be addictive, especially with the latest trends. People want to save money in their pursuit to meet current or past trends. There are some people who are classy, others are casual and like to take advantage of routine shops in the malls. However there are those that like to take stock in the vintage inspired looks and stay thrifty while trying to keep it real with savings. 360 Vintage Designs offers shopping on a budget, fashion tips, attire that’s fit for an office, school Prom or a walk in the park. As the change of season(s) approaches, 360 would like the community to stop in to see our many selection(s) The clothing found at 360 Vintage Designs is gently used and hand-picked based on the quality and the uniqueness of the garment. Don’t stress about looking your best as you go about your day, to school, work. Or an upcoming event 360 Vintage Designs has great buys for women and men , not to exclude a plus size rack. Splurging on quality doesn’t have to be expensive. 360 Vintage Designs and More offers a vintage style and a more modern feel with affordability. My motto is “Buy more and save more in a thrifty kind of way”. In addition I’d like the opportunity to give back to the community and the surrounding area to those who may be in need of my services. I am committed to my business venture, in hopes that it will release the many other passion that I hold close to my heart. * Assisting / Volunteering/ within the surrounding Hampton Roads communities. 360 Vintage Designs has clothing for men and women, particularly those looking for one of kind collections. Every piece at 360 Vintage Designs and More is hand-picked and carefully selected based on quality. Visit us… You won’t be disappointed! Dresses, Skirts, Tops, Slacks, Shoes, Boots, Handbags, Jackets, Suits, Elegant Gowns, Vintage wedding dresses, Coats, Hats, Furs, accessories not to exclude plus sizes we have a rack for you to! If you don’t see it here, tell us what you’re looking for and we’ll try to find it for you.